The idea of a steel building, or any metal building, is that the entire structure is made with metal. This is not actually true. The main components of the structure are made from metal. The main components include the frame, walls, roof and bracing. The exterior materials are not necessarily metal or steel. The history of metal buildings that ultimately gave way to steel started in the 1700s. The first metal buildings were designed for fireproofing mills that produced flammable products and risked catching fire. From the first buildings, more applications of steel and metal began to take place. The first skyscraper was built with a steel frame in the 19th century. From the success of skyscrapers to the portable metal buildings of gold miners, the development of steel residential and commercial property began to improve and evolve. Over time, the structures began to provide shelter for numerous situations, including the use of warehousing, storage and military applications. Steel buildings have evolved over the years to include numerous types of structures, shapes and looks. Understanding the types of buildings available helps determine if this option is best for preferred end results. In many cases, steel buildings break into two main categories straight-walled and arched. These discuss the main shapes of the building rather than the purpose of the building. In both cases, the two structures can serve a similar purpose. The straight-walled buildings look like traditional properties. The walls have a straight up and down shape topped by an angled roof as seen around the country. This differs from the arched buildings, which have a curved roof rather than an angled roof. Though the two basic shapes describe the look of the building, the purpose and size differs widely among buildings. The purpose can range from storage and warehousing to farming and residential houses. Commercial steel buildings are often larger in size due to the business aspect of the property. Commercial buildings often include airplane hangers, agricultural, warehouses, office spaces, storage facilities and manufacturing facilities. The size of the building varies based on the type of need and what is being stored in the building. The larger properties are often used for needs like storing planes, manufacturing goods or warehousing. Office spaces are often smaller in size. Residential buildings are usually similar to any other house in appearance. Most residential steel buildings fall under the category of straight-walled since this shape is similar to most housing around the country. For aesthetics, the residential properties use regular materials for the external layer of the building. This means it is possible to create any home appearance on the outside while maintaining the benefits of steel throughout the building. Before determining if the steel material is best to meet personal needs for residential or commercial property, it is vital to determine if the benefits fit the situation. The advantages of the building material play a large role in determining whether the property will match the needs of the company or personal construction. 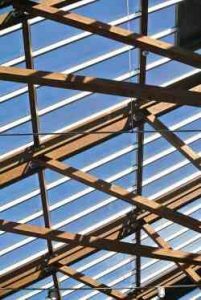 According to theory, the prefabrication of steel properties results in numerous benefits that consumers and businesses can take advantage of when making a new structure. One of the major benefits of the steel material is the fact that construction times are much shorter. The faster construction time means that the property is up and running in a short amount of time. This is due to the fact that the pieces simply need assembly rather than cutting, shaping and working to piece the product together as is seen with other materials. The metal is already shaped, cut and ready for easy assembly. The expansion of the property is another benefit. The material makes it easy to add and change the design, even in the middle of construction. Durability is one of the major considerations related to steel buildings. Unlike other structures, the material is not susceptible to cracking, termites, weather conditions, rot or even fire. Instead, it withstands almost any situation and does not attract the common problems related to wood. Lower insurance costs are another consideration. Many insurance companies offer discounts for steel buildings in residential and commercial properties as a result of the resistance to fire and other conditions. The likelihood of major damage is very low when working with steel. Sustainability and the green movement have resulted in more popularity of steel properties among the group. Steel is completely recycled and recyclable. If the building is taken apart, it is possible to recycle the material rather than throwing it in the dump. The building cost is also dramatically reduced with steel. Since it is ready for assembly, the cost of labour is much lower. The cost of the material is also lower than other options, resulting in a reasonable construction price for a new building. Before opting to purchase or build a structure, it is vital for all individuals to take time to read the agreement thoroughly and fully understand that details. Read the fine print of the agreement and always ensure that any special requests are found within the contract. When working with a commercial property, taking time to read the fine print helps avoid complications or misunderstandings in the process. When building a commercial property and seeking quotes, the fine print will help determine comparability between companies and compliance to special requests. It is always important to read this document, particularly if quotes are very diverse and seem too good to be true. In the case of residential properties, reading the agreement helps ensure the new owner of the house understands everything about the project. Residential properties require reading through the agreement to ensure no misunderstandings occur. The agreement should have everything discussed and requested as well as the final price with all labour costs included. Every commercial and residential steel building should follow the state and local Building Regulations compliance laws. Every local area has different requirements for the shape, size and standards properties must meet before building any project. Before starting on the construction phase of the structure, commercial and residential properties must follow the local requirements. If they do not meet the local requirements, it might be necessary to ask for some changes to the design, final look or structure to meet the standards set forth in the code of the town, city or local area. This compliance to building standards ensures that the structure meets safety requirements and that the project will not require potentially expensive changes halfway through the construction of the property. Before starting the project, having a signed contract in hand is a matter of preventing legal complications. The contract should specify the payment plan, the details of the project and the final cost of the project. Depending on the compliance requirements in the area, the contract details will change to reflect the code. Only after the contract is signed should the project begin. This helps prevent legal problems, particularly when working on the first project. When buying a steel building, or having one built, whether it is for commercial or residential property, it is vital to have everything worked out beforehand. This includes meeting Building Regulations compliance, writing in special requests in the contract and initial agreement, having the price arranged beforehand and setting up standards to meet throughout the construction. Only after the building is selected, the details are worked out and the contract is signed by both parties with a witness should the company charge anything to the buyer. Constructing a steel building is often one of the smartest decisions. Not only are these buildings perfect for residential and commercial applications, but they also have the benefit of durability and low cost. Keeping the key ideas of the type, appearance, compliance and legalities of the project can help make the purchase easier. Once purchased, the steel building will stand for years.